Voters force school-closing Mayor Rahm Emanuel into a runoff and demand an elected school board. Rahm Emanuel had everything going for him in his race for a second term as mayor of Chicago. He was the incumbent in a city that tends to keep its mayors—sometimes for decades. He had the endorsements of the city’s major daily newspapers—and a constant media presence in the form of more than $7 million in TV ads. He had a twelve-to-one fundraising advantage against his closest competitor—and his campaign treasury was constantly being refueled by wealthy out-of-town donors and corporate special-interest groups. He had the endorsement of his former boss, President Obama, who recorded campaign commercials for Emanuel and who jetted into Chicago just days before Tuesday’s election and appeared at the mayor’s side. Emanuel needed another percentage to avoid the runoff—50 percent plus one vote. Under Chicago’s system, all candidates for mayor and for aldermanic seats run on a nonpartisan ballot. If any candidate gets more than 50 percent, she or he is elected outright. If no one gets over 50 percent, the top two finishers in the initial election face one another in a runoff. A lot of the betting in Chicago was that Emanuel would get his 50-plus-one. But when the votes were counted, all bets were off. Emanuel finished first, with 45 percent. But that was far short of the “50-plus-1” mark, so far that the Chicago Sun Times termed the result “a huge embarrassment” for the former White House aide and Democratic Congressional Campaign Committee chair who many see as the most politically-connected mayor in the United States. Cook County Commissioner Jesus “Chuy” Garcia, the candidate of progressive labor groups such as the Chicago Teachers Union and the defender of public education and public services that have been threatened by Emanuel’s “pay-to-play” politics and municipal neoliberalism, finished a solid second with 34 percent. And the rest of the vote went to critics of the mayor: progressive Alderman Bob Fioretti, businessman Willie Wilson and William “Dock” Walls III, a former aide to the late progressive Mayor Harold Washington. “Political dynamics change as Emanuel, Garcia move into runoff campaign,” Wednesday morning’s Chicago Tribune headline declared. The featured photo was not of a triumphant Rahm running a victory lap but of “Chuy” Garcia surrounded by a multiracial, multi-ethnic circle of activists raising clenched fists of labor and community solidarity. Though his is still an uphill run, it was Garcia who took the victory lap. Across the country, progressives rook notice, and started talking about Chicago in the way they did New York during the early stages of that city’s 2013 mayoral race—when it started to look like Bill de Blasio might have a chance. How did Rahm Emanuel, who was elected without a runoff four years ago, win too few votes to avoid one this year? No Chicago election is ever simple. The city has a famously arcane politics that mingles factors of personality and power, race and ethnicity, old-school ward machines and new-money media. Emanuel practiced it with big elbows, facing frequent charges of rewarding political allies and punishing those who dared to challenge him. But he neglected the neighborhoods, especially low-income neighborhoods that needed the city most during a first term where the city was rocked by violence and economic uncertainty. If it is possible to point to one miscalculation by the mayor, it is surely his decision to close 50 schools and to provoke a fight with the teachers union, which struck for the first time in decades in 2012. The anger at Emanuel’s policies and his approach grew so intense that Chicago Teachers Union President Karen Lewis began in 2013 to prepare a challenge to Emanuel, and polls showed she might beat him. When Lewis fell ill last fall and announced she would not run, the “smart money” said Emanuel was safe. But Lewis and others prevailed upon Garcia—a former alderman and state legislator with close ties to labor—to make the race. Though Garcia had a classic Chicago story of immigration (from northern Mexico, arriving in Chicago at age 10), hard work and political success, he was not well-known citywide, he started late and he never began to rival Emanuel’s money power. But Garcia had an issue. He promised to fight for public education, to work to keep schools open and to respect teachers rather than pick fights with them. He even argued for reducing the mayor’s authority over the schools and giving power to the people: supporting an elected school board. 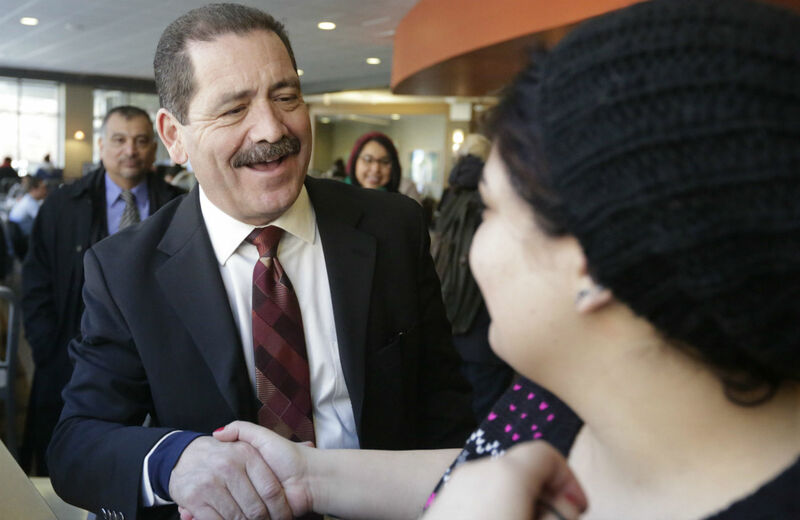 Calling for the city to “change course dramatically from the so-called ‘reforms’ offered by Mayor Emanuel,” Garcia constantly reminded voters that the schools closing and cuts under Emanuel were enabled by an appointed-rather-than-elected school board. Voters shared Garcia’s view. In addition to putting him in the runoff, they backed referendums in thirty-seven of the city’s fifty wards calling for an elected school board. After efforts to get a city-wide vote on the issue were blocked, the Campaign for an Elected Representative School Board and its allies got referendums on the ballots in most of the city’s wards. They won by overwhelming margins—in some wards taking over 90 percent of the vote. In addition, teachers and education advocates challenged Emanuel’s allies, and a number of them secured April 7 runoff spots.